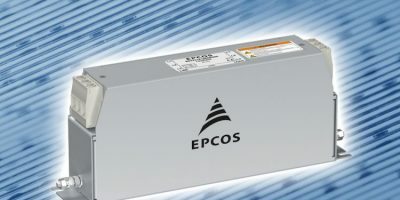 Re-engineering of the Epcos LeaXield active leakage current filter by TDK have resulted in minimised earth leakage currents in converter-based drive systems, claims the company. LeaXield is designed for applications in variable-speed drives such as those in conveyance systems, machine tools, pumps and compressors and other pluggable devices in which systems aggregate earth leakage currents which can cause residual current devices (RCDs) to trip at their threshold. As a result, RCDs are either not usable or only with additional outlay. LeaXield is available for load currents of up to 50A at a rated frequency of 50/60Hz and phase-to-phase voltages of up to 520V AC. The active leakage current filter is connected between the RCD and the EMC input filter of the converter in industry-standard three-phase TN power grids and does not require an additional power supply, adds TDK. LeaXield can be used for earth leakage currents of up to 1.0A and can effectively compensate leakage currents over a spectral range from 150Hz to approximately 30kHz. LeaXield couples a 180 degree phase-shifted current with identical amplitude to the leakage current to the respective phases and feeds it back to the source. This prevents the leakage currents from flowing through the RCD and tripping it unintentionally. The compact design makes the LeaXield suitable for retrofitting existing installations. No external power supply is required and installation outlay is minimal, says TDK. TDK Corporation is an electronics company based in Tokyo, Japan. It was established in 1935 to commercialise ferrite, a key material in electronic and magnetic products. Today, TDK’s portfolio features passive components such as ceramic, aluminum electrolytic and film capacitors, as well as magnetics, high-frequency, and piezo and protection devices. The company also offers sensors and sensor systems such as temperature and pressure, magnetic, and MEMS sensors, power supplies and energy devices and magnetic heads.